The first issue of SAGA, the new series from Image Comics by Brian K. Vaughan and Fiona Staples, has sold out of its first printing ahead of its March 14th release date. The new science fiction series, which marks Vaughan’s return to comics after the end of Ex Machina in 2010 and the highest profile work Staples has done to date, has been widely anticipated since its announcement at the 2011 Comic-Con International convention. The issue has immediately gone back to press and a second printing will be in stores on April 11, the same day as SAGA #2. SAGA tells the story of one family’s survival in the midst of an interplanetary war. Alana and Marko are from opposite sides in the centuries-old conflict, and their newborn daughter’s existence creates complications for both sides of the war. 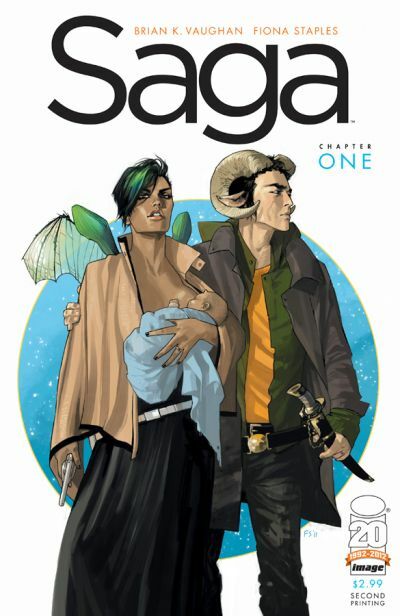 SAGA is a full-color monthly comic book available in comic book stores and multiple digital platforms. The first issue, in stores on Wednesday, is 44 pages long, with no ads.